"Speedtrapped" was the tenth episode of the third season of Daria (episode number 310). It first aired on MTV on July 28, 1999. This episode was written by Sam Johnson and Chris Marcil. After tremendous effort, Daria Morgendorffer finally gets her drivers license, complete with requisite bad photo. Jane throws her a small celebration, where she tells Daria that she'll be driving Mystik Spiral to a gig in Fremont, which is over 100 miles away. Helen and Jake leave for a weekend marriage retreat, leaving Daria to keep an eye on Quinn and the Fashion Club. However, just as Daria is about to relax, Jane calls and asks Daria to bail her and the band out of jail: they were ticketed for a traffic violation, but couldn't pay the fine. After obtaining some cash from the Lane household, Daria is off to the rescue in Jake's Lexus, with Quinn on board "in case something cool happens." Daria is a typical first-time driver: timid and slow, and easily freaked out by such things as 18-wheelers. Quinn chides Daria for her timidness and convinces her to let her drive, but abandons that plan to flirt with Travis, a singing cowboy hitchhiker they pick up. 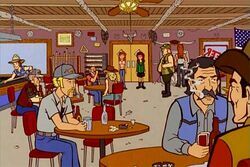 As Jane and the band endure run-ins with various jailhouse denizens, Travis manages to sweet-talk the bail money out of Quinn, forcing her and Daria to work together on a scheme to make the money back. The scheme is to sweet-talk a bar of cowboys into paying up replacement cash, to prove cowboys aren't "all bad"; when one particularly smart cowboy realises they're being conned, Daria quotes some Conway Twitty lyrics she overheard Travis said and that quietens the situation. Once they get to the jail, they find that Jane and the Spiral are working off their "debt to society" by entertaining kids at a birthday party for the sheriff's daughter. Soon, the Morgendorffer girls and the Spiral entourage head home, and an annoyed Daria shows Quinn that she's anything but timid when they encounter Travis once again... and Daria tries to run him over. We think she knew he'd jump out of the way in time. Judging from Mike the driving instructor's reaction and Jane having an aging cake waiting for her, Daria's failed the driving test a whole bunch of times (apparently due to parallel parking). This episode is one of only two, "Lucky Strike" being the other, where someone else is reciting Trent's lyrics. Quinn is briefly shown wearing glasses whilst driving the car. This is the only time that she is shown with glasses. However, the Daria Diaries included a map of Quinn's room that showed her glasses on a bedside table. 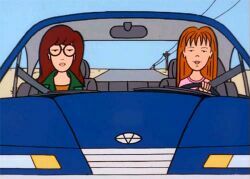 Quinn is capable of driving, even though she hasn't taken lessons yet (Daria is surprised that Quinn can drive at all). Quinn says that she learnt how to drive and visited bars during dates. Her blase reaction to Mad Dawg's indicates she's been to some very grotty, blue-collar bars. Travis' song is by real-life country singer Conway Twitty. Jane's temporary tattoo is a homage to Jasper John's "Moratorium", a piece created for a 1969 anti-Vietnam War rally. Jane doesn't mention the politics of the original piece but would logically be aware of it. Quinn is a fan of Buffy. As noted by The Angst Guy, Daria would have killed Travis if he hadn't dodged the car in time. 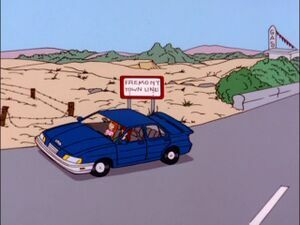 While the episode shows a "Fremont Town Limits" sign in the episode, Quinn mentions stopping at a "little town" between the sign and the Sheriff's Office; on top of that, Travis the hitchhiker is picked up near the sign and sings for a long time (Daria claims two hours but was probably exaggerating) during a ride through blank desert. Fremont may have been intended as a county and the sign was an error. This episode is also a nod to good old Country and Western Music. This episode includes three classic Country and Western songs including Travis covering Conway Twitty's "Don't Call Him a Cowboy". "Midnight Girl/Sunset Town" by Sweethearts of the Rodeo (when Daria changes the radio station at the conclusion of the episode). 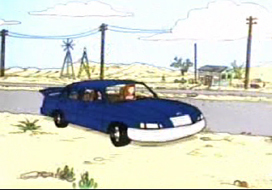 Near the end of Act 2, after Daria assumes that Travis had stolen the money Daria was going to use to bail out Mystik Spiral, a traditional commercial bumper begins. However, the bumper is interrupted by the sound of a needle scratching a record, and the plot resumes with the revelation that Quinn gave the money to Travis. A section of road between Lawndale and Fremont from Speedtrapped. Note the light, sandy soil, lack of vegetation, and pumpjack to the right of the windmill in the background. The change from Lawndale's green vegetation to the desert happens abruptly when Quinn asks Daria to pull over. This interview with Eichler dates from 2005-2006, however, and some prominent fanwork had already situated Lawndale in other parts of the United States. Michelle Klein-Hass, for example, wrote a series where Lawndale was in Connecticut, and took its title from that. Compounding this problem for fans is the landscape of the area surrounding Lawndale shown in "Speedtrapped." Fremont is only one hundred miles from Lawndale, but much of the terrain Daria and Quinn cover on their drive there resembles the arid southwest. What little community there is the landscape is appropriate to it: there is the hitchhiker Travis, a singing cowboy, and Mad Dawg's, a western saloon complete with swinging doors, and finally, the regional accents of the Fremont sheriff's staff and jailhouse regulars (including Stan and Sally). The Quiet Ones by Smileyfax starts at the end of this fic, when Daria deliberately runs over Travis. This page was last edited on 29 August 2018, at 19:23.